Importance. - This root rot fungus causes major losses throughout the United States. Windthrow of infected trees in urban and high-use areas creates safety hazards, contributing to the economic importance of this disease. 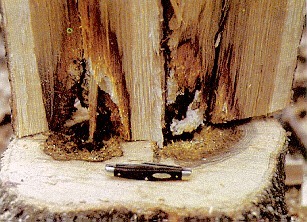 Additional losses occur from reduced vigor in both conifer and hardwood species. Identifying the Fungus. - In the fall, clumps of yellow mushrooms grow on the ground near the tree and occasionally on the bole several feet above the ground. A. mellea produces thin, black rhizomorphs that grow on the root surface. The rhizomorphs resemble black shoelaces. Decay caused by shoestring root rot fungus. (Click for detail. JPG 49K). Identifying the Injury. - Infected trees may have low vigor. Roots may show various degrees of decay, which generally becomes evident only on windthrown trees. Shoestring root rot mushrooms. (Click for detail. JPG 42K). Biology. - The fungus can live in dead roots and stumps for many years. The fungus spreads through the soil via roots. Healthy roots that come in contact with infected ones can become infected. Mushrooms produce an abundance of spores, but they probably are not important in infecting living trees. 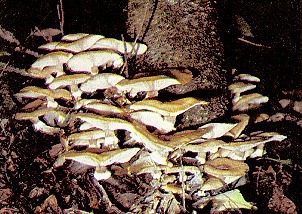 The fungus is most pathogenic on slow-growing trees. Control. - There is no practical control of the disease in forest stands. Spread can be reduced in urban environments by removing the infected trees, stumps, and large roots, and by sterilizing the soil before replanting. Any cultural practices that reduce stress and increase tree vigor will also reduce the potential for infection.